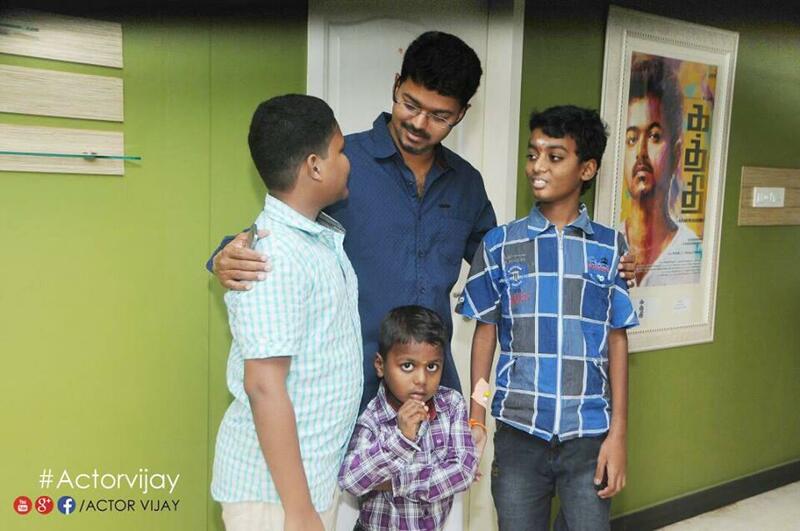 Actor Vijay was recently spotted bonding with three children from an orphanage in Chennai. The children are affected by blood cancer and are living their last few days. They had expressed a desire to meet their favourite actor and being the compassionate soul that Vijay was, he immediately invited them over. The actor met the kids, chatted with them and had some pictures taken. Needless to say, the kids were a happy lot. The actor's official social networking page, later shared, "We are happy that we could at least fulfill their last wish and make them smile. Pls Pray that these souls should live for more number of years by overcoming their difficulties!" "3 Young Children from an Orphanage in Chennai is suffering from Blood Cancer. They tried in many ways to get cured but God didn't have any mercy on them. When asked what was their final wish, they said they want to meet Actor Vijay and take a Picture with him. We received that News and they were taken to Vijay Sir. They interacted with him and took Pics with him as they wished. We are happy that we could atleast fulfill their last wish and make them smile. Pls Pray that these souls should live for more number of Years by overcoming their difficulties! ", added.